Since I have some experience of using electric dog fences, I would like to share my knowledge with you about their role, features, differences and application methodology. I’ll devote a special section for describing the best electric dog fences. And they are indeed the best ones, because I’ve studied information provided by other sites and their lists of the best fences contain about 25-40 items. Do you believe it? If we ignore all marketing tricks, it will become quite challenging to name at least 10 best electric dog fences. If we speak about about wireless ones, the list becomes even shorter – about 2-3 items. These devices are rather costly and not multi-purpose ones at all – that’s why the area of their application is limited and the idea of using them is rather controversial one itself. However, these devices have already taken their place in the world of dog breeding. Everything that I’m going to write here I took from various sources; as a rule, these are specialized forums, reviews and my own experience. 3 What is an electric dog fence? 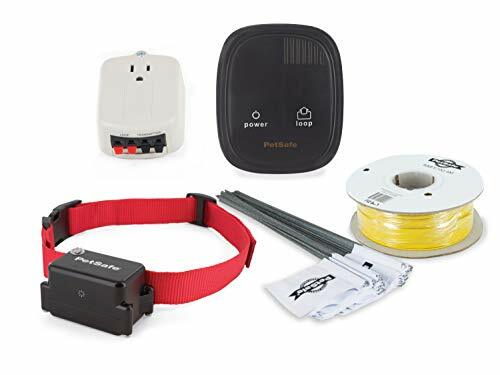 4 What are the advantages of using electric dog fences? 6 How painful is this for a dog? Is it humanly to use such a thing? 10.2 How long will the training take? Well, I don’t think you will read this article till the end. Therefore, I’ll go through the essentials in short here. And then it’s up to you to decide whether you want to read more or not. The idea of using electric dog fence is still a controversial issue, since the approach of shocking a dog is used to stop it from unwanted actions. This doesn’t harm the dog and it’s not very painful, but for someone it may become a critical factor. Electric dog fences are efficient and safe, but they are used as means of a dog’s behavior correction. Without a compulsory training and education your dog can learn to run over it or it will be scared of it to death. At the end of this article you will find some ideas about how to train your dog properly. Technically the fences are divided into two types: underground dog fence and wireless dog fence (above ground electric dog fences). The first type uses wires to transmit the signal and the second one uses radio signal for this purpose. Underground dog fence is more usable and reliable. They create a border that the dog understands and these fences have almost unlimited coverage area and what is the most important – by means of a wire you can restrict the area just according to its borders. Wireless dog fence creates only circle-shaped border and they require a flat area without large objects on it. These fences are very quickly installed and easily dismounted. We’ll discuss differences between these two types of fences in details in the middle of our article. The best electric dog fences are manufactured by several companies and you’ll have to choose between them. If you see a list containing 15 or more items of ‘the best electric dog fences’ – just close it. The person who created this list has never had any experience with what he is writing about. Quite often dog owners face the problem – the dog leaves their territory or goes where it is not supposed to be. Invisible dog fence is used to make sure that the dog won’t leave the territory or get into some dangerous area. Dogs disobey especially often once their owner is away for some period of time. This is when the invisible dog fence allows the dog’s owner make sure that his dog is safe and to control its behavior. These devices have shown good results over the years. Of course, such electric dog fence systems are useful first of all in private garden plots. Any dog or cat owner wants to be sure that his pet won’t leave the area on its own and, correspondingly, it won’t get into trouble on a road or when being attacked by other animals outside. So, what are the advantages of such systems and how exactly do they keep a dog inside some restricted area? 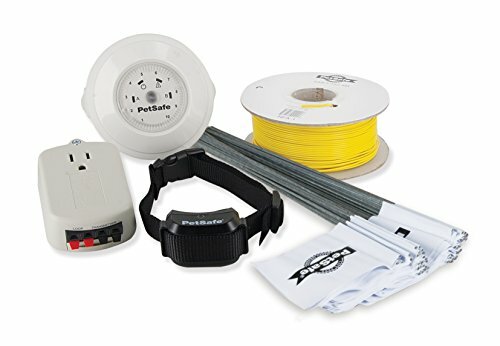 What are the advantages of using electric dog fences? They are cheap. Can you imagine – you have a dog and you have to built a fence around the area, that is as large as a golf course. If you calculate the time, money and materials required – the amount is very large. But when using the invisible dog fence, you will spend much less. This kind of fence doesn’t spoil the view. Keep in mind, that sometimes you just can’t put a fence where you want or need to. Sometimes it is prohibited or you will loose the ability to enjoy a great view and somewhere your neighbors can be against the idea of building a fence. You won’t even think about all these things when using electric dog fences. They protect by-passers from your dogs. Of course, without any doubt – your dog never bites and this is the cleverest and the kindest dog in the world. But a stranger passing by your house may not know it and he can get scared even by the most harmless pugdog. When using electric dog fences, your dog is always closed behind the invisible fence. The electric fence works using a plain and simple principle. 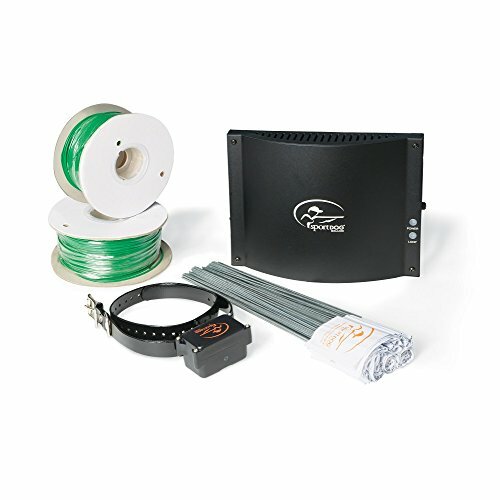 The fence set includes a boundary wire, receiver collar, transmitter and flags. You put a special receiver collar on your dog. This collar responds to approaching to the constraint line by slight electric pulse, which is completely harmless, but unpleasant for the animal. The special boundary wire is, as a rule, installed along the private area boundaries and it forms a line which the animal can’t cross. 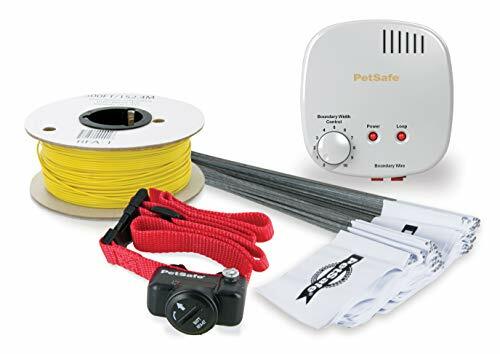 Also you can put this wire somewhere inside this area – for example, around a pool, flower beds and other objects where your pet shouldn’t get. In case of using a wireless fence you don’t even have the wires, the collar receives the signal over the air. As for the flags, in the beginning they will show your dog the size of the area where it is allowed to walk. It is better to put them inside the restricted area close to each other. Soon the dog will have to remember, that it’s better not to walk farther than the flags are put and then you can remove them. As for the operation principle, these devices are divided into electric, ultrasound and some exotic ones, that release some stored gas or strong smell. And if it wasn’t a joke, I’ve even read in the Internet about collars for cats that spray water. Electric dog collars are, of course, more spread and are likely to be more multi-purpose ones. Though, since my experience is limited to using just these devices, I won’t univocally assert this fact. Nevertheless, in this article I will write not only about them. How painful is this for a dog? Is it humanly to use such a thing? I’ve tested how this collar works on my arm, in general nothing horrible has happened. I just felt some unpleasant pins and needles in my arm, nothing more. Therefore, I don’t think that using such a collar can seriously harm a dog. Moreover, many large dogs just simply ignore it. When a pet finds itself close to the fence line, it hears a special tone, that informs a cat or a dog that it has to stop moving further in this direction. If the animal continues moving in the same direction, the collar releases an electric pulse and its power grows as the animal approaches to the border. This is a so called proportional punishment. I.e, the closer the dog is to the invisible fence, the stronger is the electric pulse it is exposed to. Such collars are absolutely harmless for an animal, they meet all veterinarian requirements – duration of the electric pulse doesn’t exceed 30 seconds. After a small, but compulsory training course dogs learn to stay just inside the restricted territory. In the beginning the collar bothers them by making them do what is required, but this doesn’t last long. After this dogs stop checking whether the fence is still working and learn the new limits of their territory. Sometimes they may forget about them, but hearing the warning tone of their collar is enough for the dog to turn around and go back. Such collars usually have a possibility to adjust the electric pulse intensity and frequency, which allows using the system for cats and dogs with different sensitivity and temper. Depending on how many pets you have you can buy the same number of collars for them. There are no restrictions in this respect. All of them will function within the set limited area. The devices themselves are divided into two types – wireless and wired ones; the latter are usually buried on ground and for this reason they are called – in ground dog fences. Wireless dog fence functions using a transmitter that distributes a signal in a circle around it. The place where the transmitter is located is the center of this circle (this is an electronic unit with antenna); it should be put on the top of the building. The power of this transmitter is adjusted correspondingly to some specific radius and when the dog trespasses this limit, its collar starts making sounds and then comes the electric pulse that grows in time. There are a few exploitative demerits here – you can’t create restricted areas shape other than a circle and there can be no passes through (or exits from) this territory. However, at that the system is easily assembled. In ground dog fence provides the clear zone for the dog inside or outside the closed loop of the wire (the area can be of any shape). That’s why if you want to keep your dog within a square-shaped territory, only in ground dog fence will do for you. In ground dog fence is the most multi-purpose one and its only drawback is the necessity to install the antenna wire along the area boundaries. You can put the wire just right on the ground or bury it to half spade depth (half of a spit). But yet you have to put the boundary wire and the larger is the territory, the more cable you need. The good news is that the cable is quite cheap and the best electric dog fence models have enough cable to cover the territory of almost any size. Advantages: you can restrict areas of any shape, fence flower beds, pools, create passages in the restricted areas, where the dog will be able to walk too. This is the classic system which I recommend. Yes, it requires to make more efforts than the wireless ones. However, at that your dog will never suffer from boundary wobble; this system has clear boundaries and it will help you to make safe any territory of any size and shape. Just compare the number of options you get in both categories and you will see everything yourself. This is a new and upgraded version of a popular device. The company has taken into account the feedback from its customers and now by means of eXtreme Dog Fence you can hedge a piece of ground up to 25 acre. Besides, the system itself is sold in various sets; you can use it both for one and for 5 dogs. It it not just water resistant, it is completely waterproof. The manufacturer states that water won’t get inside the system even if putting it up to 10 feet under water. It is hard to imagine a dog diving that deep, but it’s good to have some factor of safety. The system itself was assembled in the USA and the manufacturer provides 10 years warranty for it and a lifetime guarantee for the boundary wire! If you decided to get electric dog fence, you need to hedge a large piece of ground and you are ok if it requires to deal with boundary wire – than take a closer look at eXtreme Dog Fence. This is the one of the most multi-purpose offers on the market, it is a quality one, reliable and it is definitely worth each penny spent on it. If the previous fence can hedge a piece of ground up to 25 acre, but in this case the numbers are almost fantastic – up to 100 acre! 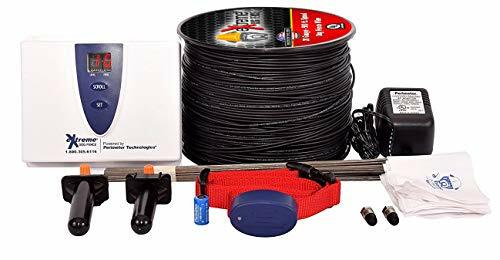 The device set includes 1000 feet of 20-gauge boundary wire and 100 flags (contain up to 1 1/3 acres), but you always can buy more if you need. 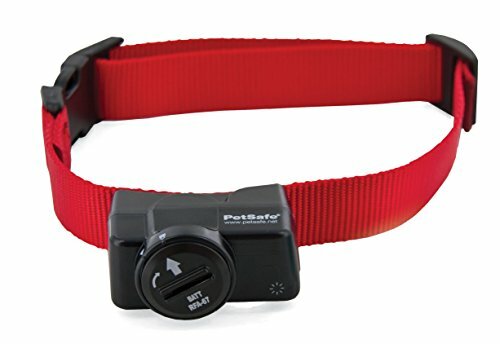 Waterproof collar receiver warns a dog if it approaches to the restricted area boundary by means of vibration and tone and it has 4 static correction levels. The collar is powered by a standard 9-volt battery, that can work up to 12 month depending on the temperature outside. But even when the battery discharges, you will know it since the collar has low battery indicator. The system key feature is a fence transmitter, that is mounted on a wall. It protects the device from voltage surges and a stroke of lightning and also it warns if the boundary wire is damaged under ground. The SportDOG Brand In-Ground Fence system will do for those who have really large piece of ground to fence. This system has moderately priced additional components and it will be the most reasonable, money-saving and reliable option to choose. As you can see from the name, this invisible fence is for really stubborn dogs. Though, frankly speaking, I don’t think that there are stupid or stubborn dogs, I think there are dogs that didn’t receive proper explanation of the rules they have to obey and the boundaries they shouldn’t cross. I do recommend you to read about how to train the dog to understand its new territory restrictions when using an invisible dog fence system. However, what to do if you have a stubborn and quite goal-oriented dog? This is when PetSafe Stubborn Dog system will help you. It has 4 static correction levels, which, as it is easy to guess, uses a bit higher power than similar devices. As a rule, these so called ‘stubborn dogs’ are quite large and they’ve got used to stand some unpleasant impacts. As the effect level of this collar uses a bit higher power, it is recommended for dogs that weigh more than 30 pounds. Includes 500 feet of boundary wire and 50 boundary flags, enough to cover about one-third acre. If it is necessary, you can increase this area up to 25 acres, but for some additional cost (situation is the same with other manufacturers). Keep in mind that the system is manufactured in the USA and it uses only 110v outlets, so it can’t be used with 220v international voltage. For a long time PetSafe company has been the leading one on the market. It was almost a monopolist in terms of quality-price ratio. Nowadays some quite strong rivals appeared on the marked (we’ve wrote about them above), but still PetSafe products occupy a high place. Therefore, don’t be surprised if you see a lot of products produced by this company in the top rating. 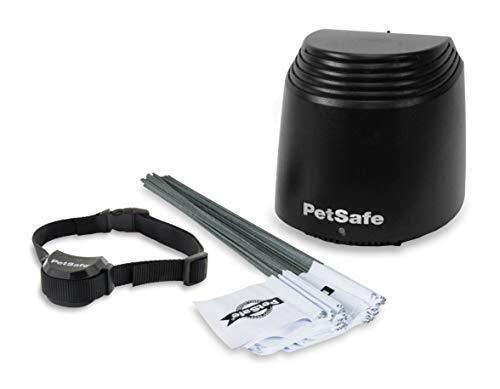 PetSafe YardMax this is an invisible dog fence for dogs that occupy a small territory. So, the standard device set will be enough for a piece of land about 1/3 acre and up to 10 acres with additional wire. Unlike other models, this one has two modes. In YardMax Mode the signal gets into the collar only when the dog has crossed the wire and starts moving away from the restricted area. At that the action continues till the dog gets back into the territory boundaries. This allows using all the territory. In Traditional Mode the collar works as usual - when approaching to the area boundary a dog gets a tone warning and if it continues moving, the electric pulse follows the warning. As you can see from the name, this invisible dog fence has a minimal set of features. Yes, it is cheaper than its rivals, but due to the fact that its wire is thinner, its length is shorter and it can cover the less area. For example, the basic device set is designed for up to 1/3 of an acre coverage; you can make it cover up to 5 acres with the purchase of additional wires and flags. As usual, they are sold as separate items. Apart from that, the system is a standard one – its waterproof collar is for dogs with a neck diameter from 6 до 28 inches and it has low battery indicator. Pay attention, that the battery is a weak point of this collar and it causes many complaints from customers. This is another product, which name speaks for itself. As you see, the level of electric pulse applied to a large aggressive dog and to a small lapdog has to be different. Besides, they even need a territory of different size. But they both have the same desire to get away from the courtyard. So what to do in this case? The first option is to set a minimum effect level or get a PetSafe Elite Little Dog. This is a ground fence for dogs and cats over 5 lb with a neck size from 6 to 16 Inches. Unfortunately, considering all the advantages of wireless dog fences, yet they are not that good as systems using boundary wires. Apart from the fact that the signal is highly distorted if there are some obstacles or strong magnetic radiation around the territory, another big problem is boundary wobble. Depending on various conditions, the signal boundary may sift up to 2-8 feed aside. Now imagine how your dog is supposed to feel if it gets an electric pulse at the same place, where yesterday it was safe to walk. Another problem is a small number of worthy models on the market. I spent loads of time trying to find the best offers for you, but I found only three. And all of them are made by the same company. Here are they. Do you want to get the best wireless dog fence? Well, it wasn’t invented yet. 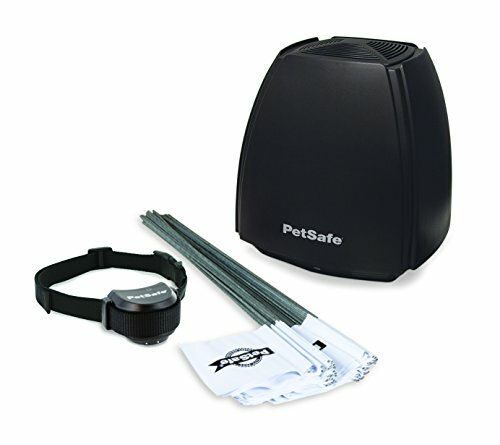 But if there is something close to what you need, this is a PetSafe Wireless Fence. As we’ve already mentioned, it has no wires and its transmitter can cover a circle-shaped area up to 90 feet in all directions. I.e. provided with ideal conditions maximum diameter of a restricted zone is 180 feet. But, don’t forget that ideal conditions are not very likely to happen and the signal will inevitably have to overcome some obstacles, which will make it weaker and decrease its radius. The collar is a waterproof one, with the battery charge indicator, optionally it may have some spare batteries, it has 5 static correction levels and a tone warning. In general, this is the best and time proved variant. Of course, it isn’t perfect, but only because the wireless technology itself is not perfect as well. Unlike the previous model this one has larger range of coverage. Adjustable range is up to 105 feet in all directions. Besides, this system has a chargeable battery and it can function with unlimited number of dogs, if you get more collars. Do you have a curious pet, that ignores your warnings and likes walking far from home? He likes walking in the yard and he spoils your flower beds or he is a swimmer, who likes swimming in your pool? Are you afraid that your pet can cause or become a victim of a car crash? 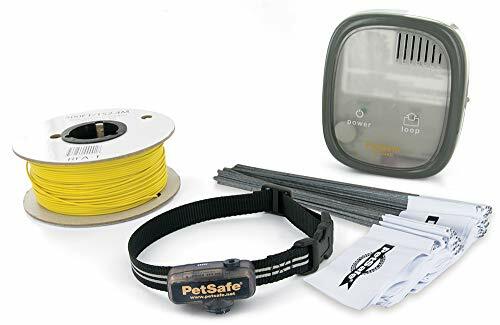 Electric invisible fence "PetSafe Free To Roam", that consists of a transmitter, antenna wire and a collar will help you to limit the area where you dog can walk and create some restricted zones without constricting your pets activity. "PetSafe Free To Roam" is a modern and high efficient system that allows one or several pets to walk freely inside the restricted area up to 180 feet in diameter with or without a fencing. 5 LEVELS OF STATIC CORRECTION: Customize to your pet's temperament. Also has a tone only mode for training. So, you’ve decided that a dog is very clever animal and it will get everything about the fence itself; you were too lazy to train it. Then you installed a boundary wire, created a restricted area and set maximum electric pulse value on a dog’s collar. You let the dog go to see how it works. Here is what you’ll see. The dog decides to run away on the street and approaches to the territory border. When it gets to the restricted area boarder you’ve set, it’ll unexpectedly receive an unpleasant electric pulse. It will get scared and jump at the direction where its head was looking a second ago. You shouldn’t count on the electric dog fence in this case, since this ‘well stimulated’ leap allows to overcome any obstacles. Thus, the dog will jump over the restricted zone and the collar will stop working. What you dog will understand from this experience is, that the main thing is to gather speed, close its eyes and jump. That’s why, don’t neglect training your dog before installing any electric dog fence. If your territory has a real fence and the dog can’t jump over it, but it runs away by means of digging a hole under it or getting over the fence – as a rule, training the dog just once is enough. For really mischievous dogs it may take more time. If the territory isn’t fenced or the fence isn’t high and the dig can just jump over it – train it twice a day (in the morning and in the evening) for two days. You can do it for longer period of time, but not less than for 2 days. The dog should form a clear reflex where it can go and where it can’t. It bears repeating that, if there is no real fence around the territory, train your dog twice a day for at least two days! The first thing you should start with is to put a collar with a receiving set on a dog. Give the dog a day or two to get used to it. The dog has to get used to the new thing you put on its neck. The receiving set has its weight and it feels differently on the dog’s neck, than just an ordinary collar. Secondly, the dog feels electrodes on its skin and this distracts it as well. If on top of all the dog will get some unpleasant impressions near the restricted zone border, even the silliest dog will get that all the troubles come from this thing on its neck. Therefore, while the dog is getting used to its new collar, you can start installing the invisible dog fence, adjusting the restricted zones, warning signals and reading the manual. So, now the dog has got used to the collar, the electric fence is installed, the zones are set. Let’s get to the crucial thing, which you can’t skip – training the dog to stay within the restricted area. Take the dog wearing a special and an ordinary collar on a tight leash. This is to control the dog’s behavior. Slowly take the dog to where the restricted zone boarder starts. Explain the dog that it can’t go further and continue approaching to the boarder. The collar will make a tone warning, continue moving till the collar generates an electric pulse in the correction zone. By holding the leash hold the dog and don’t let it jump forward or aside when it gets scared. Take the dog back to the middle of the area, where everything is ok. Calm the dog down if necessary. Move a bit aside along the center of the restricted zone (quite far from the fence) and then approach to the invisible border one more time. Go to point 1 and repeat the actions until you go round all the restricted zone. Try several spots in front, behind, on the left and on the right, then you can move in the opposite direction. The main condition is to go around the whole restricted area and demonstrate it to the dog. By the end of this walk the dog will dig its heels in when it just hears the tone warning signal. If so, congratulations – you did everything right. The training is over. For mischievous and misbehaving dogs you can repeat the process, if you want. You should take the dog to the invisible border from inside of the restricted area. The receiving set of the collar has an embedded safety system. After generating a pulse string the collar will switch to standby mode, till the dog crosses the warning zone and leaves the correction zone. If you go along the invisible boarder, after some period of time the collar will stop generating electric pulses and a sly dog will understand that it just has to suffer for some time and it’ll be over. That’s why take the dog to the invisible fence from inside and straight across the fence. You approach to the fence and go back, you can’t take the dog aside. Just take a few steps forward and then back. The power of electric pulse the collar generates should be high enough that the dog would feel constant unwillingness to approach to the restricted zone. If the dog during the electric pulse just shakes its head, it is very likely that the pulse isn’t strong enough or the collar electrodes don’t reach the dog’s skin. Adjust the collar properly on the dog’s neck and only after this make the electric pulse stronger. If there is a real fence around the perimeter, you should start training the dog from closed gates. You should finish training by opening the gates and taking the dog outside the fence into the correction zone through the open gates. This way the dog will understand that even if the gates are open, it will still have trouble after trying to get away. This way you will make sure that the dog won’t get out in the street through the open gates. In future, if you want to go for a walk with your dog you will have to turn off the transmitter and without taking the collar off pull the dog through the gates (the buffer zone of the invisible fence). Take the dog outside, take it for a walk and take it back through the gates. Usually, you have to really pull the dog through the gates, because it doesn’t want to get into the ‘prohibited area’. After several walks the dog will understand – it can go through the open gates only with its owner, but not alone. Of course, it is reasonable to take the dog for a walk only after it gets used to the new reality. If there is no real fence around the territory or you have a dog that likes running away, keep training it till you see that the dog has formed a stable reflex. So, after you finish the training process the dog will have to accept the new reality. Everything is ok till it stays inside the restricted zone, but when it approaches to its boundaries things get worse. The dog doesn’t know how far this bad feeling stretches and you won’t find a dog that would like to check it itself. Of course, the dog will try to run away, but it won’t jump, it will just try to slowly approach to the boundary. The dog will come, put its head into the warning zone, make sure that the ‘trouble’ is still there and stop doing this for some period of time. How long it will last, it is hard to say. Some dogs go to check the invisible fence once in a few months. But (quite seldom) there are some dogs who check the invisible boundaries every day, it looks like there are doing some kind of job. If you trained the dog properly, it won’t try to run away with almost 100 % probability. However, there is one exception – if the battery in the collar discharges and you miss this moment. How much time is required in general to train a dog to interact with electronic devices? After getting the collar let the dog to wear it for 2-5 days, but don’t activate it during this time to make sure that your pet won’t understand that there is connection between the device and its action. Duration of the training depends on a dog’s temper and breed as well as on its owner. Does using electric correction devices do any harm to my dog? Such a correction is based on static electricity, which is completely harmless for a dog. It just causes some unpleasant feelings that resemble those that you get from devices used for physiotherapy. When training dogs minimal power levels of electric pulse are use, i.e. those that the dog can feel. Modern certified devices are equipped with a digital control of effect level, so that the dog won’t get hurt. However, I don’t recommend using the collar for dogs in a bad physical shape (having health problems, cardio-vascular system issues) without consulting a vet. How long does the battery function? The battery working capacity depends on its model and how often it is used. Starting from what age electric correction devices can be used for dogs? Such devices can be used for training dogs older than 6 month. How frost or cold can effect the electric devices efficiency? the device may auto shutdown (because of discharged batteries). charge (replace the battery) in dry and warm place. If the device case is cold, leave it in a warm place for some period of time till it gets warm and only then charge it. Is it necessary to put the boundary wire under ground? No, the system will function properly on the ground as well, but to prevent the wire damage it is recommended to dig it about 3-5 cm deep under the ground. Does it matter where the main transmitter is located? Yes. The transmitter should be put inside the house or in the place where the temperature isn’t lower than +7 С. The transmitter shouldn’t be located next to electrical boxes and large metal objects. Can I put the boundary wire in the same place where there is electric, phone, TV or antenna cable? No, this may cause systems outage. If there is no choice and the wires have to intersect, do this perpendicularly. Never lay the wire in parallel with other electric wires for distance longer than 20 cm. May I train more than one dog at the same time? Yes, but you have to buy an additional collar. Most of the systems support functioning with several collars simultaneously.